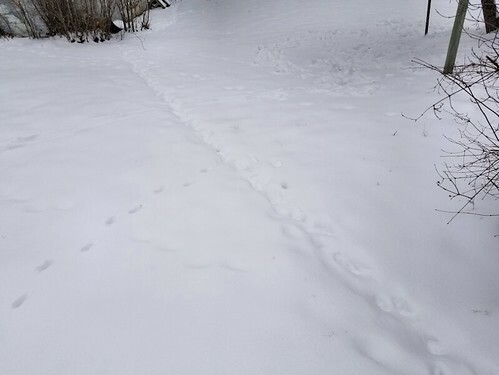 It snowed most of the night, which means that when I did my outside stuff this morning, the only tracks in the snow were those of animals. It was interesting to follow them along, and try and figure out what story they were telling. 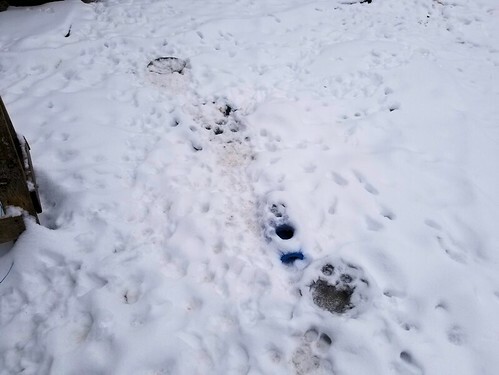 The cats’ outside food and water bowl area was just covered with paw prints! The food bowls were empty, even after being topped up last night. The water bowls still had liquid water in them. You can certainly tell that cats are still using the space under the storage house a lot! You can also see deer tracks, under the ornamental apple tree. The other tree also had lots of hoof prints under it, and as I walked around, I could see where some came in through the maple grove, while others wandered through our south yard, out the people gate, towards the barn. Seeing these lines through the living room window had me flummoxed. What on could they be from? From the size of these paw prints, I could see that my brother’s dog had come to visit us already! 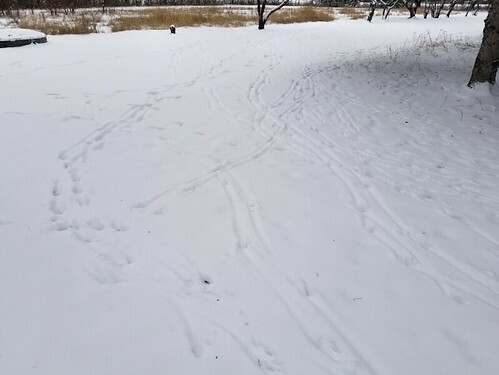 Walking along, I could see where the animals followed along tree lines and fences; where a deer had jumped the fence at the edge of the spruce grove, then walked along the other side, to the driveway, and where a bird landed in the snow, hopped a few feet, then took off. 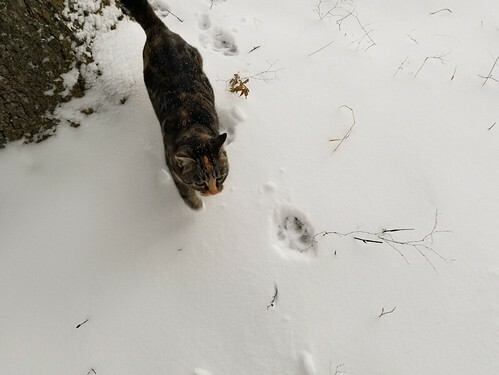 Of course, I was followed by cats as I did this, and was amused by how Rolando Moon was so careful about stepping into the tracks of others – whether it was a deer’s hoof prints, or my own boot prints – so as to step in as little snow as possible. It’s interesting how the snow reveals just how busy things are in the yard during the night!